DON'T LET YOUR NEIGHBORS SO HUNGRY. YOU CAN HELP. A DONATION OF $10 BUYS $50 WORTH OF FOOD. 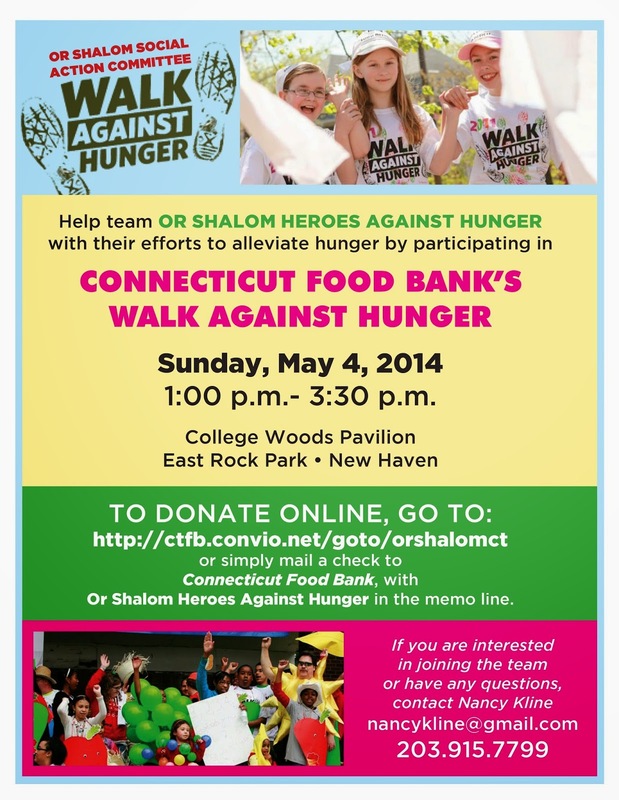 WALK OR SEND A DONATION OR BOTH. Plan to enjoy a day at Quassy Amusement Park & Waterpark in Middlebury CT on Saturday, May 3 or Sunday, May 4, 2014. You will help The Barnum Museum during their time of restoration and recovery. 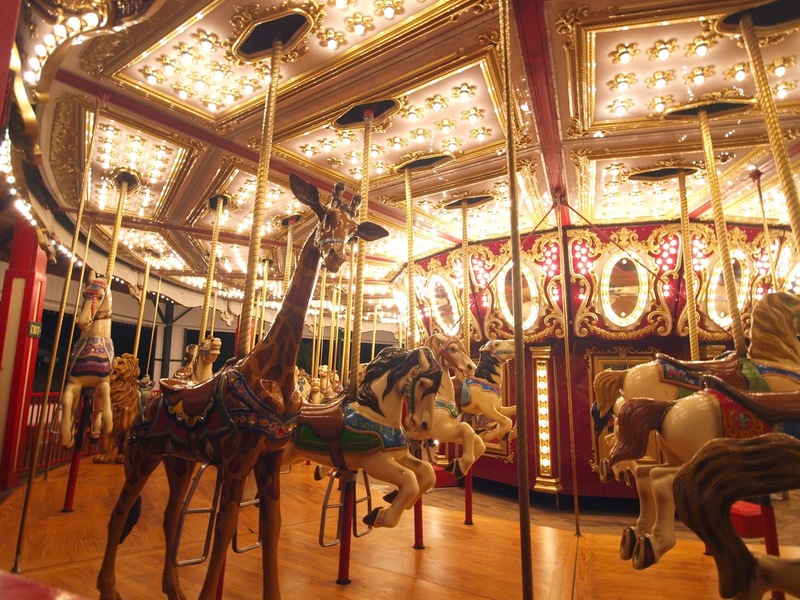 Take advantage of this fantastic offer online by 11 p.m. on Friday, May 2 and Quassy Amusement Park & Waterpark in Middlebury will donate $5 to The Barnum Museum* in Bridgeport for each $35 Carload Pass purchased. The Carload special is valid for up to 10 persons in your vehicle. Parking is included, and each person in the vehicle will receive an all-day ride wristband. This offer to benefit The Barnum Museum is valid online only. You may forward this invitation to family and friends for their participation. His rainbow hued story, which some might term as tall tale. will be spun purely for the sake of entertainment by the innovative and inventive New Haven Theater Company, just four years young, at their new home, The English Building Market, 839 Chapel Street, New Haven on Thursday, May 1 and May 8 at 8 p.m. and Friday, May 2 and 9 at 8 p.m. and Saturday May 3 and 10 at 5 p.m. and 8 p.m. "Shipwrecked! An Entertainment. 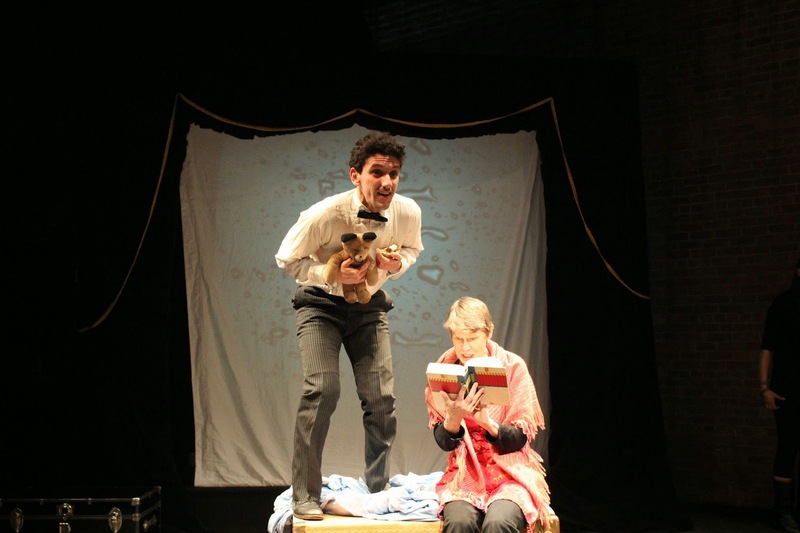 The Amazing Adventures of Louis de Rougemont (as told by himself)" is a product of the New Haven Pulitzer Prize-winning playwright Donald Margulies. Will he be defeated by an octopus, find despair on a deserted island, drown in a giant whirlpool or rather take a fanciful ride on a sea turtle, marry an Australian aborigine and meet the Queen of England? To discover the truths to the tale, if there are any, follow Louis and his faithful dog Bruno literally to the ends of the earth. Louis will be played by Christian Shaboo, while Erich Greene will be his trusty pooch and the Queen of England, Margaret Mann and Mallory Pellegrino will play his overly protective mother and an Australian prospector, his bride Yamba and a newspaper boy, the ship captain and an aborigine Bobo, with the help of Jesse Gabbard, Katelyn Marshall and Tyler Williams who are all making their NHTC debuts. To Peter Chenot, the inventive director, " 'Shipwrecked" is a wonderful play because it lets the audience imagine the story along with the actors on stage. We try to create a jumping off point for the story telling." The projection design will be created by Drew Gray. For Christian Shaboo who plays Louie, "it's a once-in-a-lifetime type of role, incredibly exciting. The amazing stories cover a range of emotions and I live in the moment, with a wonderful ensemble cast who play all the other parts. This all heightens the experience. The production is going great and our new theater space is truly unique and we are making it our own. It now has the feel of a real theater." For tickets ($20, students and children $12), go online to www.newhaventheatercompany to ticketleap.com. Hang on to the coattails of Louis de Rougement as he sets off from France on what will be a thirty year intrigue in the late 1880's, one that takes him to Australia and a "dangerous and marvelous world." His childhood sickroom books of "Robinson Crusoe" and "Arabian Nights" are sure to pale by comparison. SHAKING THE FOUNDATION OF "THE HOUSE THAT WILL NOT STAND"
Gumbo is a hearty, rich, heavily spiced soup that originated in southern Louisiana in the 18th century. Its stock is strongly flavored with a variety of vegetables and either meat or shellfish. In Marcus Gardley's world premiere play "The House that will not Stand," the Yale Repertory Theatre in a co-production with California's Berkeley Repertory Theatre, the gumbo dish speaks to combined cultures that meld and blend together into a unique time in our southern American history. Until Saturday, May 10, the gumbo pot will be served up hot and peppery and it will be a gourmet treat not soon forgotten. It may burn your tongue and fire your heart and tickle your funny bone all at the same time. Beartrice Albans is the powerful, no nonsense matriarch who rules with an iron fist and steel spine over all she possesses. As a free woman of color in 1836 New Orleans, she has bargained her way to society's pinnacle by entering into an illegal interracial "marriage" with a wealthy white man Lazare (Ray Reinhardt) three decades before. Beartrice is brought to startling life by Lizan Mitchell who does not want any of her daughters (Joniece Abbott-Pratt, Flor De Liz Perez and Tiffany Rachelle Stewart) to submit to this system of common law mating with a white man, a practice that does not protect their rights and borders on being a slavery of a different sort. Beartrice is so convinced she is right in her beliefs that she argues and fights with Lazare, ultimately causing his death. He wanted his daughters to attend a ball, held once a year, that would have matched them to eligible white men. These men of power were able to sustain two households, but on their death, only the white wife could inherit. Into this house, built on a foundation of lies, deceit and sand, live Beartrice's half-crazed sister (Petronia Paley) and Makeda, a conjuring, voodoo believing woman who knows it all and keeps the household running, a spirited Harriett D. Foy, who will do anything to earn her own freedom. This textured and layered canvas is vibrant with a rainbow of colors, on an elegant drawing room set designed by Antje Ellermann. Patricia McGregor directs a fine, almost all female cast in a drama that explores the price we pay for freedom from a multitude of angles with poignancy and power. For tickets ($20-98), call Yale Repertory Theatre, 1120 Chapel Street, New Haven at 203-432-1234 or online at www.yalerep.org. Performances are Tuesday to Saturday at 8 p.m., with a 2 p.m. matinee Saturday and some Wednesdays. Will Beartrice be able to triumph and move her daughters to Paris so they will be truly free before their beautiful home collapses all around them? Elle Woods is perky, peppy, preppy and pretty , a princess in pink, but she is also perplexed and perturbed when her boyfriend Warner Huntington III unceremoniously dumps her for someone who is precocious and more perfect. Once she understands she has been intellectually insulted, Elle decides to cash in on her preciousness and apply to Harvard Law School for admission,to follow her love and win him back, as part of the class of 2005. What results is the delightful “Legally Blonde The Musical” lighting up the stage of the Jorgensen Center for the Arts in Storrs on the campus of the University of Connecticut until Sunday, May 4. The Connecticut Repertory Theatre is literally on fire with this pinkaliocious gem. Elle, a bouncy and ebullient Courtney Hammond, with her little pup Bruiser, a chihuahua, a puppet pooch created by puppet designer Carianne Hoff, at her side, doesn’t doubt for a nanosecond that she will gain admittance to the sacred ivy shrouded walls of Harvard. She rises to the academic challenge admirably, following her snobby jerk of an ex-boyfriend (Will Graziano) right to the entrance halls. He believes because she is blonde and beautiful, interested in fashion and being properly accessorized, that she is no more than party fluff. ( Nicole Lewis), a sincere and really nice guy Emmett (Colby Lewis) as a new love interest, a Professor of Law (David Adkins) and a client Brooke (Khetanya Henderson) to defend, a famous fitness personality who is accused of murdering her much older husband. Pink, Elle’s signature color, is bountifully evident in her dress, shoes, purse, make-up, resume and computer. She proves her legal smarts, that she is not a Malibu Barbie but, rather, a Brainiac Barbie, a fact which even Warner’s new girlfriend Viv (Whitney Andrews) admits. “Legally Blonde” has a book by Heather Hach, music and lyrics by Laurence O’Keefe and Nell Benjamin and direction and choreography by Gerry McIntyre. For tickets ($7-37), call the Jorgensen, at 860-486-2113 or online at www.crt.uconn.edu. Performances are Wednesday and Thursday at 7:30 p.m., Friday at 8 p.m., Saturday at 8 p.m. and Sunday at 2 p.m. The Nutmeg Summer Series has just been announced: "A Chorus Line" from June 5-14, "The Sunshine Boys" from June 19-29 and "Gypsy" from July 10 to 20. Now is the time to lock in your subscriptions for all three. Watch Elle help the underdog with her brilliant and fashionable plan of legal defense, do some fancy footwork with a jump rope, try Irish step dancing and prove she is way more than Warner’s Pooh Bear. Along the way she banishes stereotypes, inspires women to rise to empowerment and discovers true love! Just to see Bruiser the chihuahua and Rufus the bulldog race across the stage is worth the price of admission. The essence of Elvis may have left the building if we’re talking about Graceland or Nashville, but you can find his spirit at Torrington's Warner Theatre weekends where the music and magic is “All Shook Up.” A musical comedy conceived by Joe DiPietro, inspired by and saluting the songs of Elvis Presley, will have you swiveling your hips, donning a black leather jacket or a pink poodle skirt and a pair of beautiful blue suede shoes, until Sunday, May 11. Think “Footloose” meets “Cyrano de Bergerac,” collides with “A Midsummer’s Night Dream,” with a touch of “Romeo and Juliet” and you’ll be close to what happens in a small Midwestern town in 1955 where a opinionated and prejudiced Mayor Matilda Hyde keeps a tight rein on everybody’s actions and thoughts. Prescribing to the Mamie Eisenhower Decency Decrees, the Mayor has forbidden loud music, tight pants, dancing, public necking and any interracial dating. Her moral compass is stuck at zero tolerance. The calm and quiet is disturbed and disrupted when a stranger rides into town on a motorcycle and begins to question the stable and staid status quo. Chad is a rebel and a roustabout and proud of it, and he will change the town whether it’s ready or not. Chad has such an effect on the local auto mechanic Natalie that she disguises herself as Ed to win his approval and affection. When it comes to being cool, town folks like Natalie’s dad Jim and her good friend Dennis line up to take lessons. When Chad thinks Miss Sondra is the cat’s meow, he sends Ed to woo her, only to have Sondra fancy herself smitten by Ed instead. More than two dozen great Elvis tunes like “Jailhouse Rock,” “Hound Dog,” “Teddy Bear,” “Blue Suede Shoes,” “Don’t Be Cruel” and “Burning Love,” under the musical direction of Aaron J. Bunel, keep the rafters rocking. This fine cast, under the direction of Sharon A. Wilcox, who also does the choreography, provides hunka, hunka happy times. They all work to keep the joint jumpin'. For tickets ($18-26), call The Warner, 68 Main Street, Torrington at 860-489-7180 or online at boxstaff@warnertheatre.org. Performances are Friday and Saturday at 8 p.m. and Sunday at 2 p.m. Say "I Love Mom" for a special buy one, get one offer on Mother's Day, Sunday, May 11 only. You “Can’t Help Fallin’ in Love” with Chad and the gang as they “Follow That Dream,” declaring “It’s Now or Never.” Bebop on over to Torrington and enjoy the finger snapping, toe tapping fun. CGMC INVITE YOU TO "HANG TEN"
Ready for a romp on the beach? The Connecticut Gay Men's Chorus is anxious to sign up to be both lifeguards and surf board instructors. They'll supply the sun, the sand and the sunblock lotion and you bring the beach balls and the tropical drinks, with or without little pink umbrellas. Get set to party hearty as the wild and wonderful guys of the CGMC invite you to "Hanging Ten!" On Saturday, May 3 at 8 p.m. and again on Sunday May 4 at 4 p.m., the guys, probably clad in short shorts and flip flops, will inaugurate the summer festivities at the Co-Op Arts and Humanities High School, 177 College Street in New Haven, just a few doors past the Shubert Theatre. Hang on to your beach blankets and towels as Annette and Frankie team up with Snookie and The Situation. Yes, go back and read that line again. These fellows are known for their clever irreverence and this time around is no exception., Put on your most colorful and comfortable mu-mus and get set for fun-fun-fun in the sun-sun-sun. Great harmony and lots of unexpected treats are in store, so put on your sunglasses, your visor and bikini and take part in the festivities. For tickets ($30), call 203-777-2923 or online at www.ctgmc.org. Don't forget the CGMC's monthly Saturday night offering of Bingomania, definitely not the game your blue-haired granny played. Games are held, with a different theme each month, at the Annex Club, 554 Woodward Avenue, New Haven just off I-95. Call 1-800-644-2462 (CGMC) for news on the May 17th event. Joan Crawford will be there to oversee the fun. Prizes and contests make the evening major comedy. Admission is $20, with doors opening at 6 p.m. for the 7 p.m. games. April was Peep Show Bingomania, with Easter Bonnets on parade. Prepare to hang ten, putting all ten toes off the front of a long board while surfing a wave, kicking back and having a rad day. Jump in, the water's fine. Beware, the Syn Family, known as the most dysfunctional family on earth, is on the road again and coming to a restaurant near you. Consiglio's Restaurant, at 165 Wooster Street, will officially be invaded on Friday, May 2 at 7 p.m. and you are invited to the much needed therapy session as they act out all their grievances in "Revenge of the Syn Family." 'Revenge of the Syn Family' brings us together at the announcement party to the upcoming marriage of their daughter, Harriet, one of three siblings. 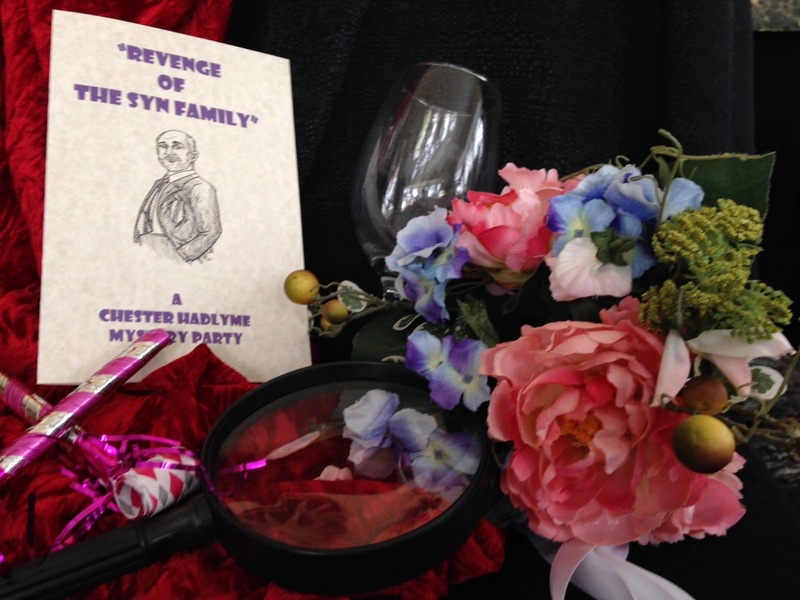 Rumors abound as to who it might be... and one wrong move in this family usually means disaster," according to master sleuth Chester Hadlyme. While they get their angst and act together, you will be enjoying a festive three course meal with lots of delicious choices, starting with appetizers like fried calamari, eggplant Napoleon or stuffed mushrooms. For your main course, consider chicken Amalfi, boneless chicken breast sauteed with sundried tomatoes and artichoke hearts, finished in a balsamic reduction sauce over linguine, or Sole Provencal, with olives, capers, plum tomatoes in a lemon white butter sauce over linguine, or perhaps Veal Marsala, veal sauteed with mushrooms and sundried tomatoes finished in a marsala wine sauce. There are 9 gourmet choices in all. For desserts, there is a trio of yummy selections, either chocolate mousse cake, Godiva Tiramisi or creamy Italian gelato. Presiding over the tornado of troubles is the tried and true and trusty head of detectives Chester Hadlyme (an earnest Michael Sayers who is the maestro of mystery writers, having penned over 60 in a quarter of a century) who doubles as your genial master of ceremonies. He knows something bad always happens when the Syn family gathers and you can bet your broccoli rabe that this time will be no exception. Sayers has been invading the personal problems of the Syns since he wrote 'Seven Deadly Syns" many moons ago. He describes them as "Ma and Pa Kettle, with money, who demand sequels. I have the best character actors who excel at improvisation. They take on a role and become the character. I let them go and they take over the plot and never look back. Often on the way home from a performance, we write another mystery in the car." To solve the mystery and play some fun games, like a couples game "So You Think You Know Someone," or a scavenger hunt or music trivia, make a reservation ($55) with Consiglio's, a family tradition in fine Italian food for 75 years, by calling 203-865-4489 or online at www.consiglios.com. How much fun is it to witness the silly shenanigans of a truly crazed clan and know you are not related to any of them. Living on dreams is an impractical pastime if reality intrudes its menacing head. Hope and promise can be giant balloons that inflate with the fantasies of what could be until facts cause them to pop. For the Candelaria family, especially for mama, their dreams swirl around show business, the theater and performing on Broadway. This Puerto Rican family lives and breathes dance steps and song lyrics. 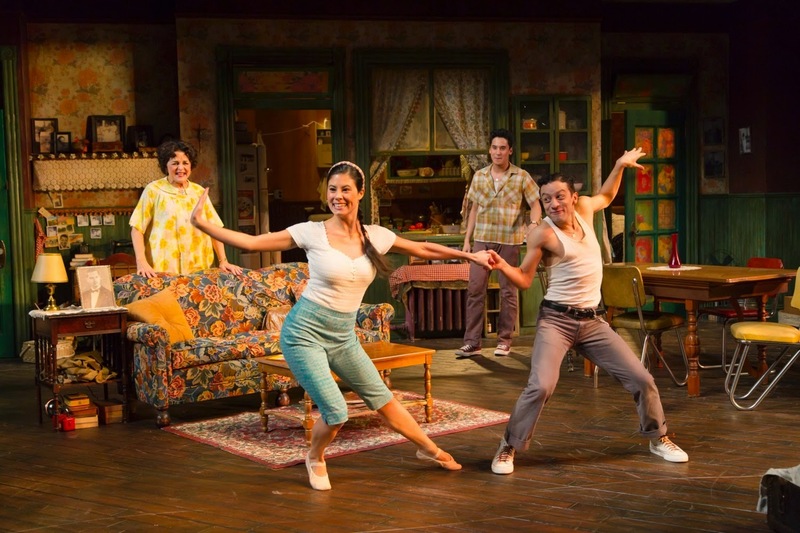 Their apartment in New York City in the summer of 1959 is focused on a production of "West Side Story," a show mama desperately wants her progeny to audition for and star in. To witness their preparations for the big debut, head to the Hartford Stage until Sunday, May 4 for "Somewhere," a new play by Matthew Lopez. Dreams feed the soul but they don't put food on the table or pay the apartment's rent. The first sign of trouble is a letter from the city to inform them that their home is going to be torn down to make room for a new project: Lincoln Center for the Performing Arts. The family has 30 days to vacate and find new accommodations. dancing aside, to deal with the day-to-day problems of survival. When he informs his mother Inez, a nurturing but stubborn Priscilla Lopez, that they must make plans to move, she refuses to accept the news and tears up the relocation orders. In her mind, the matter is finished, done, finito. Meanwhile younger siblings Cisco (Zachary Infante) and Rebecca (Jessica Ann Naimy) have swallowed mama's fantasies whole and with the help of their adopted brother Jamie (Cary Tedder), prepare for auditions for their "dream" roles. After all, Jamie is the assistant to famous choreographer Jerome Robbins so their success is almost assured. Giovanna Sardelli directs this touching and charming and dance filled (thanks to Greg Graham's choreography) glimpse into the lives of this hopeful family. The set, with its criss-crossed lines of laundry, by Donyale Werle is a welcome into their world. For tickets ($25 and up), call Hartford Stage, 50 Church Street, Hartford at 860-527-5151 or online at www.hartfordstage.org. Performances are Tuesday at 7:30 p.m., Wednesday at 2 p.m. and 7:30 p.m., Thursday at 7:30 p.m., Friday at 8 p.m., Saturday at 2 p.m. and 8 p.m. and Sunday at 2 p.m.
Root for the Candelaria clan to have all their hopes come true in this fine production with heart and soul and lots of fancy footwork. For Elizabeth, the decision of which path to take can be almost paralyzing...so the logical solution is to take both ways. As Liz and Beth, she can indulge all her possibilities. 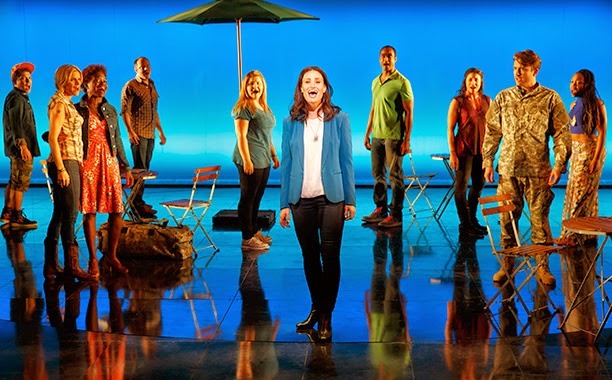 Come meet Idina Menzel in her dual role in "If/Then," the intriguing new musical with music by Tom Kitt and book and lyrics by Brian Yorkey, at the Richard Rodgers Theatre on 226 West 46th Street in New York City. With the premise that you never know what will happen to you, Liz and Beth both learn how to live, cautiously and impetuously. After twelve years of marriage in Phoenix, Elizabeth has returned to New York to discover life's grand design. Her journey is enhanced and complicated when she meets Kate (La Chanze), her next door neighbor, Lucas (Anthony Rapp), her old activist friend, Josh (James Snyder), a soldier she happens to meet in the park and Steve (Jerry Dixon), her city planner boss in one reincarnation. The fact that life is never a straight line causes Elizabeth's dual personas to engage in twists and turns that complicate and color her worlds. Which job should she accept? Which man will she love? She confesses, "I get lost in what might be." This beautiful and powerful play soars to glorious heights with such songs, verging on operatic, like "It's a Sign," "You Never Know," " Here I Go," "Man Up," "Surprise," "What If" and "What Would You Do?." Michael Greif directs this compelling journey with sensitivity and skill. Mark Wendland's set design mirrored ceiling reflects wonder and charm. For tickets ($60-165), call Ticketmaster at 877-250-2929 or online at ticketmaster.com or If/ThenTheMusical.com. Performances are Wednesday at 2 p.m. and 7 p.m., Thursday at 8 p.m., Friday at 8 p.m., Saturday at 2 p.m. and 8 p.m. and Sunday at 3 p.m. Whether you believe in fate or life's grand design, you'll enjoy traveling Robert Frost's less known paths as the parallel lives cross and intersect. Think circus. Think carnival. Think scheming fathers and reverse psychology. Think children and conflict and a little chaos and a little comedy, with lots of song. When two well meaning fathers plot to bring their children together by building a wall to separate them, the results are truly fantastic. 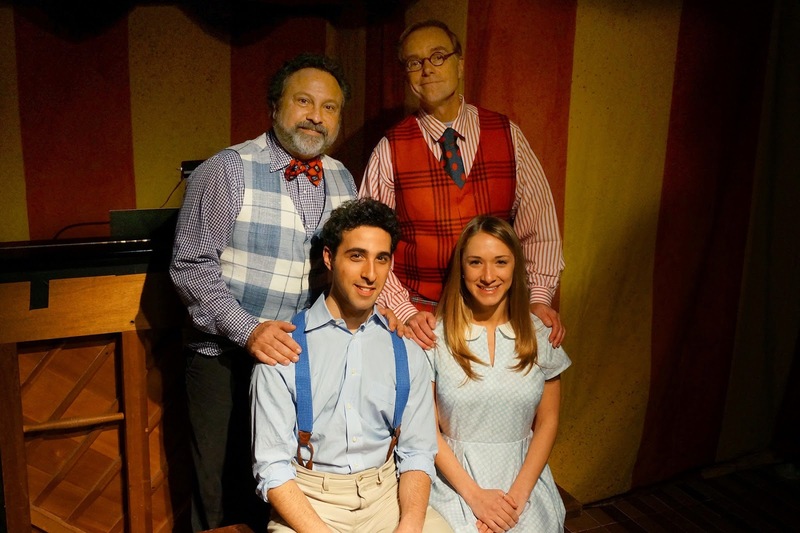 In the longest running musical in the world appropriately titled “The Fantasticks,” this simple tale of love and scheming, of day dreaming and harsh realities, of young innocence and cruel awakenings was originally told by Tom Jones and Harvey Schmidt in 1960. Since its humble beginnings Off-Broadway, it has played to audiences for over 20,000 performances there and all over the world for over fifty years. Now Music Theatre of Connecticut will be entertaining this magical musical until Sunday, May 4 with its own original offering in their intimate black box setting. Come meet the boy Matt (Jacob Heimer), the girl Luisa (Carissa Massaro), the fathers (Lou Ursone and Jack Doyle), El Gallo, the narrator (Tony Lawson) and the comic actors. (John Flaherty and Jim Schilling) who aid the plot by faking an abduction of Luisa so Matt can conveniently rescue her, further win her love and reconcile the supposedly feuding fathers. The road to true love certainly does not run smoothly, according to the road map the papas prepared, and life lessons are learned by everyone. Memorable songs like “Try to Remember,” “Soon It’s Gonna Rain,” “Plant a Radish” and “Round and Round” advance the story as Matt and Luisa discover the wonder of young love and the disillusionments that often accompany it. Kevin Connors directs this delightful tale where a wall, cleverly played by Shanna Ossi, uses a chest of tricks and props to aid and abet the action. For tickets ($25-45, with $5 off for students and seniors) call the MTC, 246 P ost Road East, lower level,, Westport at 203-454-3883 or online at www.musictheatreofct.com. Performances are Friday at 8 p.m., Saturday at 4 p.m. and 8 p.m., with matinees Sunday at 2 p.m.
Join two parents in their age old quest to do the best for their offspring by plotting and scheming and manipulating and causing results that threaten to destroy all they’d hoped to create. A special bond often exists between grandparents and grandchildren, a relationship that is precious and dear and may have entirely skipped the generation in between. Ask a grandparent about their offspring and bragging rights ensue as does a stream of photographs, now on their SmartPhone rather than from their wallet. 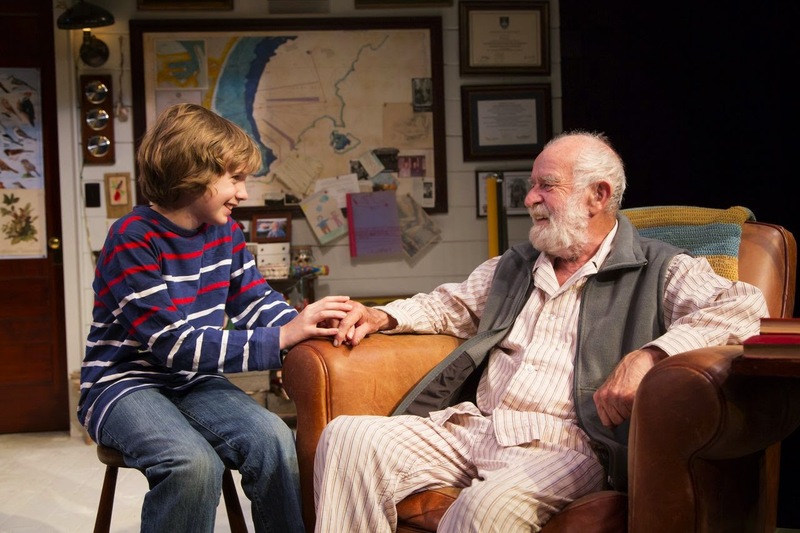 Come and meet a grandfather, Oupa, and his delightful grandson, Boba, as they share their love for each other and hopes for the future in the world premiere play "The Shadow of the Hummingbird" by famed South African playwright Athol Fugard on Stage II of New Haven's Long Wharf Theatre until Sunday, April 27. This is but the newest in Athol Fugard's stable of almost three dozen works. Not only has he written it, but he also stars as Oupa, after an absence from the stage for over a decade and a half. Eugene Lee's inviting study set welcomes us to "The Shadow of the Hummingbird," as a virtual tribute to the art work of ornithologist John James Audubon, a man obsessed with faithfully creating painted portraits of these feathered beauties. An aging Oupa has always loved these flying creatures and, in fact, has recorded his impressions and sightings of them and of life in general in dozens of notebooks he has penned over his lifetime. This gentle and philosophical play opens with his searching for a particular passage, to a reference to a hummingbird's elusive shadow as it flits, reflceting against his study's back wall. This introductory scene has been written by Paula Fourie from Athol Fugard's actual unpublished notebooks. Ou[a's precocious grandson Boba bursts into the quiet room, with imaginary sword posed to strike, as the pair playact slaying imaginary dragons and monsters. Their special loving bond is evident in their words and actions as they meet in secret. Oupa's son and Boba's father, one and the same man, has forbidden their relationship but they are willing to risk his ire. Gordon Edelstein directs this poignant moment in time with the love and caring it deserves. This gentle interlude in time is 60 minutes, without an intermission. Tuesday at 7 p.m., Wednesday at 2 p.m. and 7 p.m., Thursday at 8 p.m., Friday at 8 p.m., Saturday at 3 p.m. and 8 p.m. and Sunday at 2 p.m. and 7 p.m.
Come witness the energetic interactions of a master, Athol Fugard, as he gives life lessons on alternating performances to amazing twin fifth graders Aidan and Dermot McMillan from Middletown as Boba. Learn how to catch the hummingbird's fleeting shadow. ELI WHITNEY MUSEUM SAYS "KNOTS TO YOU"
If you were searching for the true definition of a Renaissance Man, look no further than that master of many virtues, Leonardo da Vinci. He wore more hats the Dr Seuss's Bartholomew Cubbins as he was prolific and accomplished in almost too many disciplines to mention. An Italian born in 1452, he was known for his prowess as a mathematician, a painter, sculptor, architect, inventor, engineer, anatomist, botanist, geologist, cartographer, musician and writer. No wonder that he was the inspiration twenty years ago for the unique fundraiser held every April by Hamden's Eli Whitney Museum. 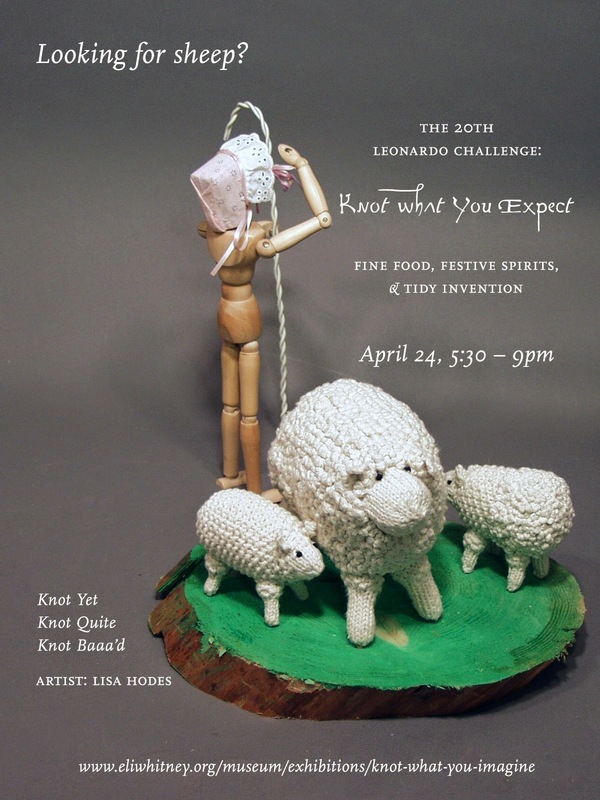 Leonardo was renown for his artistic genius and he would have been pleased and proud to be the namesake for the 20th Annual Leonardo Challenge. 100 artists from all parts of the country are invited to create a novel entry using the material of the moment. In past years, the unusual artistic medium has been items as diverse as ice cream sticks, playing cards, keys, mirrors, rulers, pencils, well, you get the idea. This year's vehicle of choice is knots. If you're a Boy Scout, a sailor, a rock or mountain climber, a boater, a macrame artist, an arborist, a fistherman or even a surgeon, you are probably familiar with this useful device. A knot can be utilitarian or decorative. Needless to say, the invited artists are busy getting their loops, bends and hitches ready, to produce a mobile, a picture, an item of clothing, a toy, a piece of jewelry or furniture, the possibilities are endless. Who knew there are knots called monkey's fist, butterfly, anchor bend, figure eight, constrictor, or cow, clove or barrel hitch? On Thursday, April 24, all entries will be on display at the Eli Whitney Museum, 915 Whitney Avenue, Hamden from 5:30 p.m. to 9 p.m. The gala fundraiser, entitled "Knot What You Imagined," includes enticing food and drink choices from the Big Green Truck Pizza, The Wine Group fine wines, Caseus, Whole G Breads, Small Kitchen, Big Taste, Koffee & Thimble Islands Brewery. www.eliwhitney.org/museum/exhibitions/knot-what-you-imagine. All the proceeds will provide workshops and scholarships for students to explore new worlds. a – challenge – to come up with something fitting." Apply your imagination and sense of whimsey and adventure to this latest challenge. The creations will be on display until May 11, free and open to the public. They are guaranteed to be Knot-What-You-Imagine. You might remember her best as the wise-cracking waitress Alice on the sitcom of the same name who tries to start a new life for herself and her young son at a diner known as Mel's. The crabby, ill-tempered Mel was the proprietor of the greasy spoon that makes Alice wonder why she is in Phoenix and not pursuing her dream of a singing career. Linda Lavin is both an actress and a singer who has honed her skills on Broadway in such plays as "Broadway Bound," "The Sisters Rosensweig," "The Diary of Anne Frank," "The Last of the Red Hot Lovers," "Gypsy" and "The Tale of the Allergist's Wife." In films and television, she is noted for "Damn Yankees," "The Nurses," "Rhoda," "Barney Miller," "The Muppet Show," "Law and Order: Criminal Intent," "Touched by an Angel" and "The Sopranos," to name drop a few. 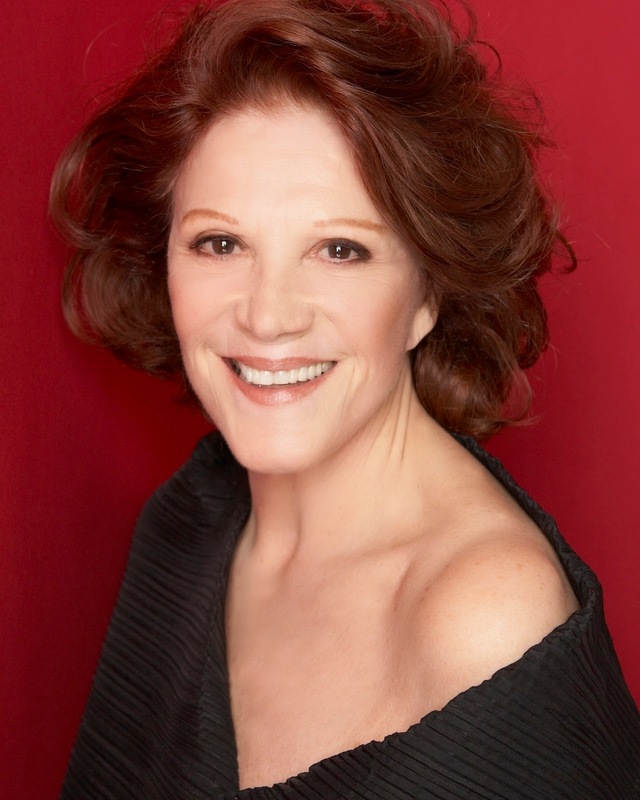 To get up close and personal with this versatile lady, attend the Sacred Heart University's American Legends Series for an intimate conversation with Linda Lavin on Sunday, April 13 at 3 p.m. at the Edgerton Center for the Performing Arts. Executive director of the Edgerton Center, Jerry Goehring will conduct an "Actors Studio" type interview that will feature video clips of her stage, television and film career as well as questions and answers about her varied and illustrious show business career. The audience will also have a chance to chat. Ms. Lavin, who was inducted into the Theater Hall of Fame in New York City in January 2011, is currently in rehearsal for an upcoming Off-Broadway premiere of "Too Much Sun" by Nicky Silver at the Vineyard Theatre, 108 E. 15th Street, New York. She will play a celebrated actress Audrey Langham whose life unravels as she prepares to play the lead in a new production of "Medea." She flees and seeks sanctuary at the home of her married daughter whose welcome is forced and less than cordial. Her relaxing summer by the sea is like a stormy ocean, not calm and peaceful as she expected it to be. "Too Much Sun," under the direction of Mark Brokaw, will begin previews on May 1 and officially open May 24. In addition, Ms. Lavin performs regularly with her trio in her hit nightclub concert "Possibilities" and recently released a CD with the same name. Let Linda Lavin entertain you with tales of her fascinating career, all the way from Alice to Audrey, and beyond. 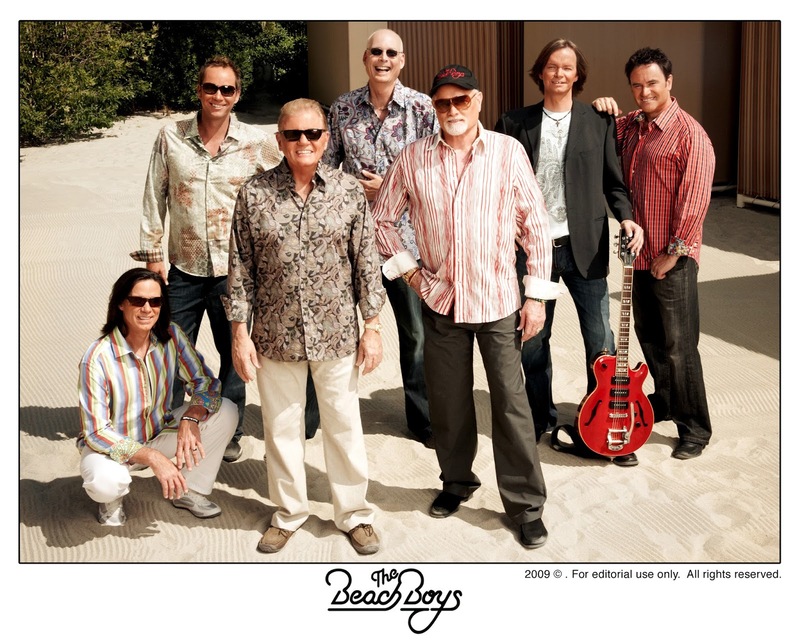 Could the Beach Boys possibly be celebrating their 50th anniversary? Has their super music making machine been cranking out hits for five decades? Are they still wearing their trademark loud floral Hawaiian style shirts? The answers to the trio of questions are all a resounding yes. Get ready to go “Surfin’ USA” with the guys who made it their reason to be when the Beach Boys bring their unique California style to Sacred Heart University. Edgerton Center for the Performing Arts will celebrate these rock and roll icons for one performance only on Saturday, April 12 at 8 p.m.
“Wouldn’t It Be Nice” to have “Fun, Fun, Fun” as the “Good Vibrations” invade all their rousing “Rock and Roll Music.” Called “America’s Band,” the original group consisted of three brothers, Brian, Dennis and Carl Wilson, their cousin Mike Love and a good friend Al Jardine. They were good old California boys who made surfing cool and California girls objects of love. In 1988, the core group was inducted into the Rock and Roll Hall of Fame. Having sold more than 100 million records, in 2004 the group was number 12 on Rolling Stones magazine’s list of the 100 Greatest Artists of All Time. At Sacred Heart, you will hear Brian Wilson, Mike Love, Al Jardine, Bruce Johnston and David Marks croon the tunes that made them famous. Come sing along to “Kokomo,” “God Only Knows,” “Help Me Rhoda,” “Surfin’ USA,” “Don’t Worry Baby,” “Cool Cool Water,” “I Get Around,” “Barbara Ann,” “Surf’s Up” and “It’s a Beautiful Day,” to name but a few. For tickets ($50), call the Edgerton Center, Sacred Heart University, 5151 Park Avenue, Fairfield at 203-371-7908 or online at www.EdgertonCenter.org. Wear your loudest sports shirt and your coolest smile and mosey over to lock lips with this great group that has been making merry music for many decades. "ROMANCE LANGUAGE" THE WORDS OF LOVE? There's an old saying that you "should be careful what you wish for." 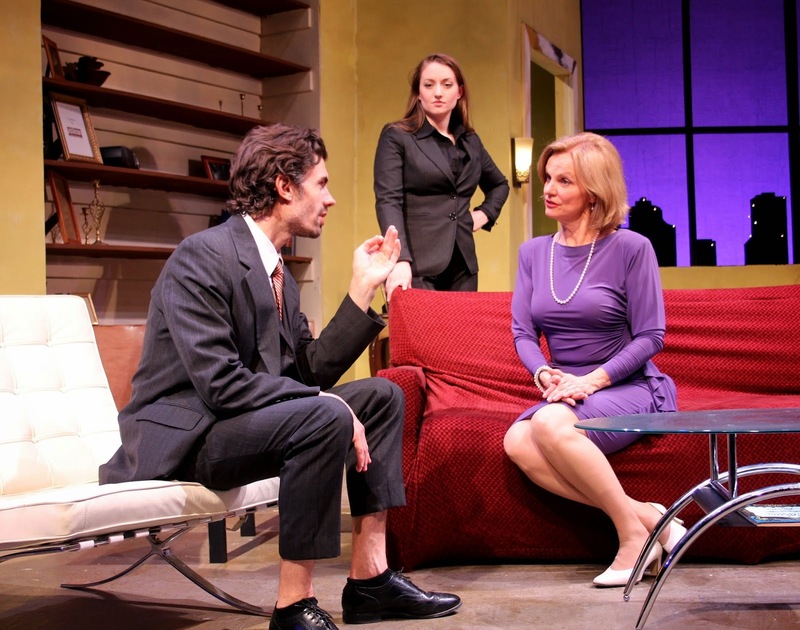 When high powered attorney Penny Morgan, who is married to her job, advises her mother Kay to develop new interests and hobbies now that she is alone, Penny is less than pleased when her mom listens.To discover the intriguing consequences of Penny's request and Kay's compliance, head over to Seven Angels Theatre in Waterbury before Sunday, April 27. The world premiere of Joe Godfrey's "Romance Language" offers a world of opportunities to Kay Morgan. Will she devote her time, now that she has been a divorced widow for several years, to taking tap dancing lessons, volunteering for a new charity, signing up for watercolor painting classes, the possibilities are endless. Kay, an eager to please Audrey Heffernan Myer, heeds her daughter's good advice and decides taking lessons in Italian are the perfect choice. To that end, she hires Fiore Benedetto, a charming and handsome young tutor, captured smoothly by Stephen Sherman, to teach her how to converse in his most romantic native language. When his instructions quickly escalate into much more than friendship, a concerned and anxious daughter, portrayed in all her protectiveness and angst by Jenny Ashman, emerges as a knight in armor to guarantee her mom is safe and not the victim of a scam. Could the much younger Fiore really be in love with Kay, so many years his senior? Does he see her simply as a way to earn his green card and as a ticket to a wealthy lifestyle? Could Penny be jealous that her mother has found happiness with a man while she has been unsuccessful herself? Will issues from the past, such as an overly devoted daughter to a father, emerge as a reason to blame her mom for what she views as abandonment when Kay sought divorce five years ago? Sasha Brett directs this triangle of confrontation that plays out like an opera, a love both Fiore and Kay share in common. For tickets ($31-45.50), call Seven Angels Theatre, 1 Plank Road, Waterbury at 203-757-4676 or online at www.sevenangelstheatre.org. Performances are Thursday at 2 p.m. and 8 p.m., Friday at 8 p.m., Saturday at 2 p.m. and 8 p.m. and Sunday at 2 p.m. Motives are emotionally in question as suspicions swirl and fog the truth in this play where passions drive actions. Get out your leotards and tie on some dancing shoes and get thee over to Playhouse on Park in West Hartford by Sunday, April 13 for some energetic and spirited fancy foot moves guaranteed to make for happy feet. Heaven becomes a disco when God commands you to dance. Consider it the eleventh commandment! Conceived, directed and choreographed by Darlene Zoller, "I'd Rather Be Dancing!" is a delightful tribute to the likes of a Gene Kelly and Fred Astaire and will make you want to take a lesson or three in this wonderful pastime from Arthur Murray. The talented troupe is passionate about their art and they want you to join them in their dedicated pursuit of the art. Think John Travolta and his magic moves and you are ready to trip the light fantastic with these guys and gals, from ages 20 to 50, two even pregnant, who have been practicing for this performance since last October. God, a demanding Gail D. Schoppert, is really at the helm of heaven directing the proceedings. With his adorable and hard working assistants, angels trying to earn their wings, Hillary Ekwall and Victoria Mooney, God has to decide whether a man (Rick Fountain) deserves to enter the Pearly Gates or be sent way downstairs to visit Satan, Spencer Pond, who claims this role is the best one he's ever done. The non-stop action is infectious as numbers like "A Wild, Wild Party" start the proceedings and segue to "A Little Party Never Killed Nobody." A man however does bite the dust and finds himself at Heaven's door hoping to be admitted. He needs to redeem himself and prove his worth. He doesn't fare as well as he'd hoped and then has the chance to try the other spectrum in such numbers as "Disco Inferno." In every instance, from well known numbers like "It Don't Mean a Thing" and "Steam Heat," the choreography is top notch and the costumes vibrant and colorful. If you think a Zumba class is high energy, you haven't seen anything yet like this high stepping powerhouse posse. The angels work so hard that they are awarded their furry appendages in record time. A special tap dance number is executed with supreme skill by special guest Tyler Knowlin. For tickets ($20-32.50 ), call Playhouse on Park, 244 Park Road, West Hartford at 860-523-59000, ext.10 or online at www.playhouseonpark.org. Performances are Wednesday at 7:30 p.m., Thursday at 7:30 p.m., Friday at 8 p.m., Saturday at 8 p.m. and Sunday at 2 p.m. 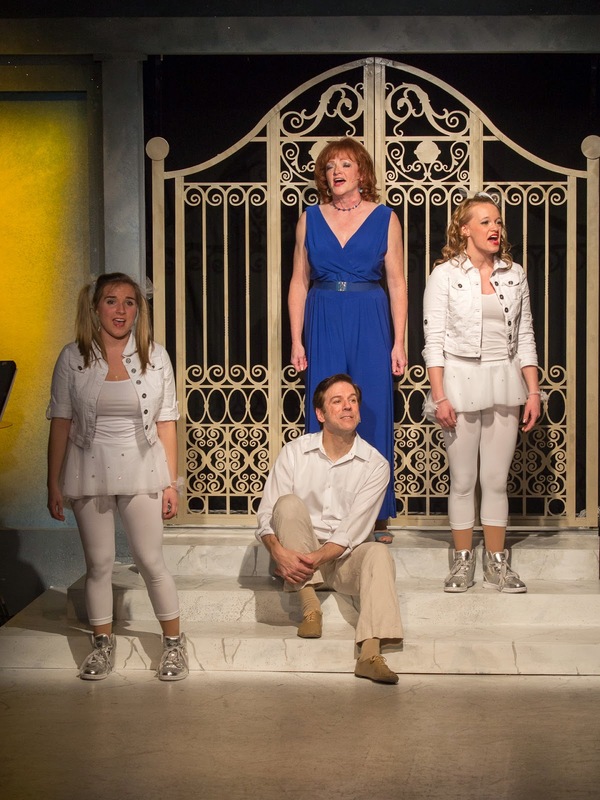 Tap your way up to heaven on the direct stairway with suave and sophisticated steps as the Resident Dance Company of Playhouse on Park leads the way to the Pearly Gates. The International Edible Books event took place in New Haven yesterday at the Creative Arts Workshop and was a sight to behold. It's an annual event where individuals and families make something edible to honor their favorite book. Entries were Charlotte's Web, featuring a lady finger cake stuffed with lemon custard and a chocolate spider web on top, with Wilbur the pig in front. Other entries were a carosel of animal cookies to recognize the book The Merry-Go-Round, a pot of hot chicken soup in honor of The Chicken Soup for the Soul books, home-made fortune cookies and cold noodles to recognize The Fortune Cookie Book, an abacus to recognize a numbers book made of round cake balls frosted and held together with cookie sticks, a Booklava made of bakalava, well you get the idea.